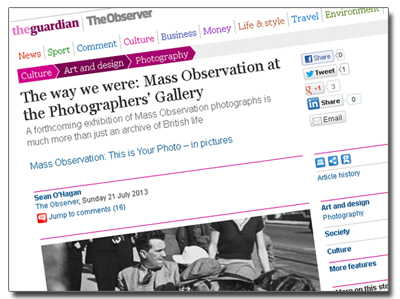 There is a nice write up in the Observer about the new Mass Observation: This Is Your Photo exhibition taking place at the Photographers’ Gallery in London. It has been curated by Russell Roberts, Reader of Photography at The University Of South Wales. The exhibition runs from the 2nd of August to the 29th September 2013 ( admission free ).